S&S V111 engines are perfect for applications that require great horsepower and torque, but not at the expense of dependability and engine life. They are similar to the V124 engines, but the shorter stroke results in lower piston speed for longer engine life, and less vibration. The lower compression ratio makes fuel requirements less critical, and the automatic electric compression releases make starting even easier. 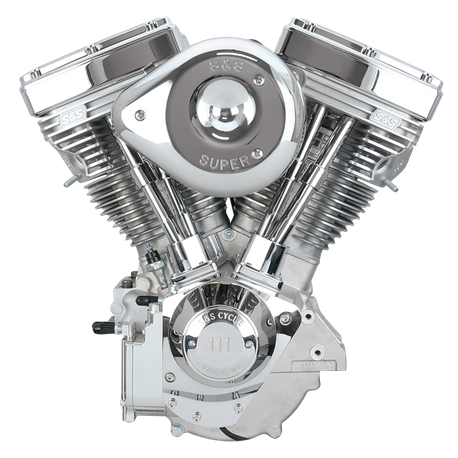 V111 engines are available in natural aluminum, black wrinkle powder coat and polished finishes, and for carbureted applications only. The S&S Super E carburetor is standard equipment, but you have your choice of the S&S S&S Intelligent Spark Technology (IST®) or S&S Super Stock™ ignition systems. Two year warranty. These engines are intended only for closed course competition use and are not legal for vehicles used on the street.